The first steps are on the outer dome. 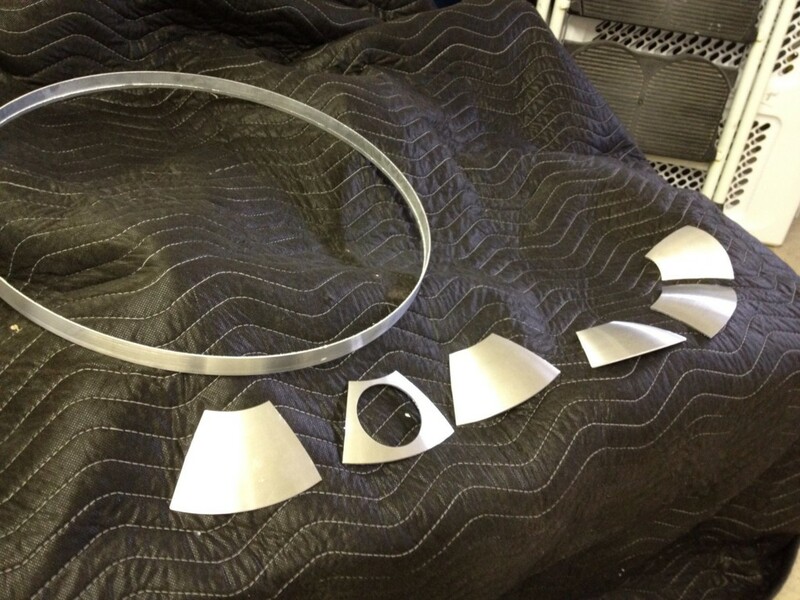 When the laser cuts the dome there are pieces left behind that must be removed by hand. And there are also semi-sharp metal burrs that need to be removed. Gillian watches as I work on cleaning up the dome. Here is the underside of the dome. Numbers are written on all the panels so that we can tell where they came from. I went a little overboard on labeling because I didn’t want to leave anything to chance. 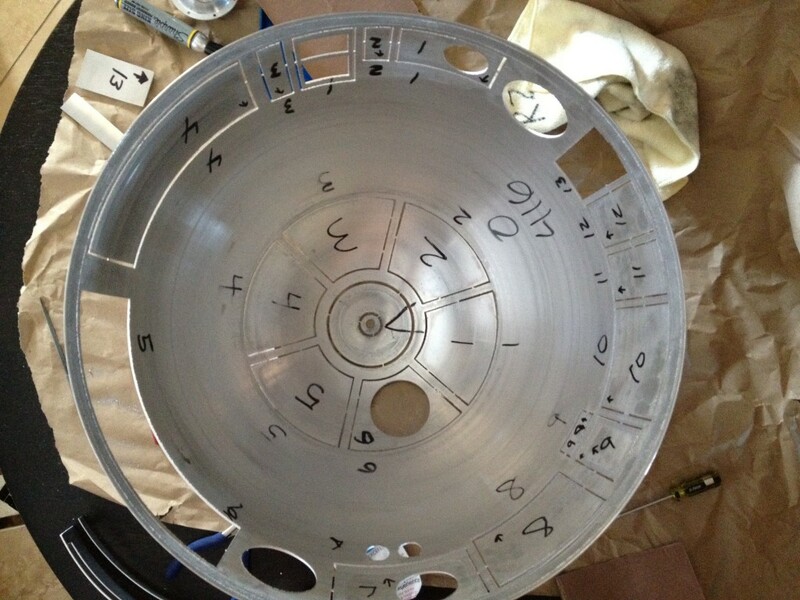 Numbers are written on the inside of the dome so we can match the panels back to where they go after they are removed. While waiting for time to do more work, I put the dome on a side table with a light underneath. looks cool! All the gaps where the blue light is coming through were the pieces that had to be removed. You can also see the small metal tabs that are holding the panel pieces in place. The dome before most panels are removed looks cool with a colored light under it. 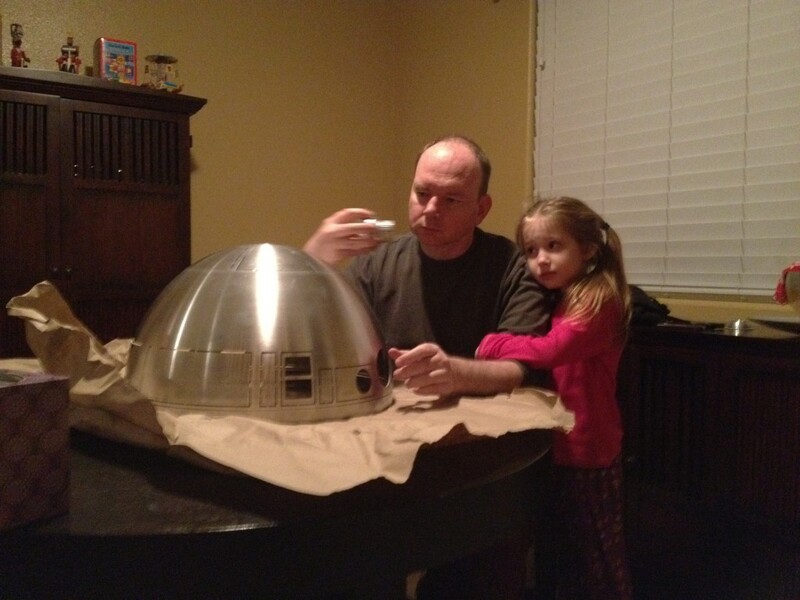 One afternoon I decided to try to make some progress on the dome. I used a hack saw to remove some of the larger tabs. Usually you can remove the bottom tab this way which leaves only two side tabs. These will friction apart by twisting the panel back and forth. The dome with a few more panels removed. A warning to any builders out there… aluminum is not a strong metal. While working with the file on one side of the dome I didn’t notice that I was accidentally bending one of the thinner rings on the other side of the dome (the one above in the bottom of the picture), but it easily bent back into shape. I don’t want to do that again. 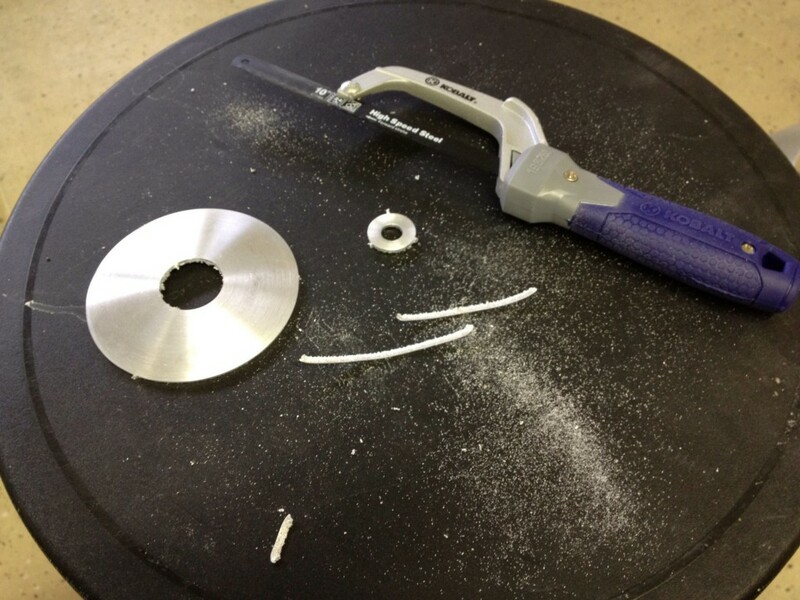 The hack saw was a quick and easy way to remove the metal tabs. 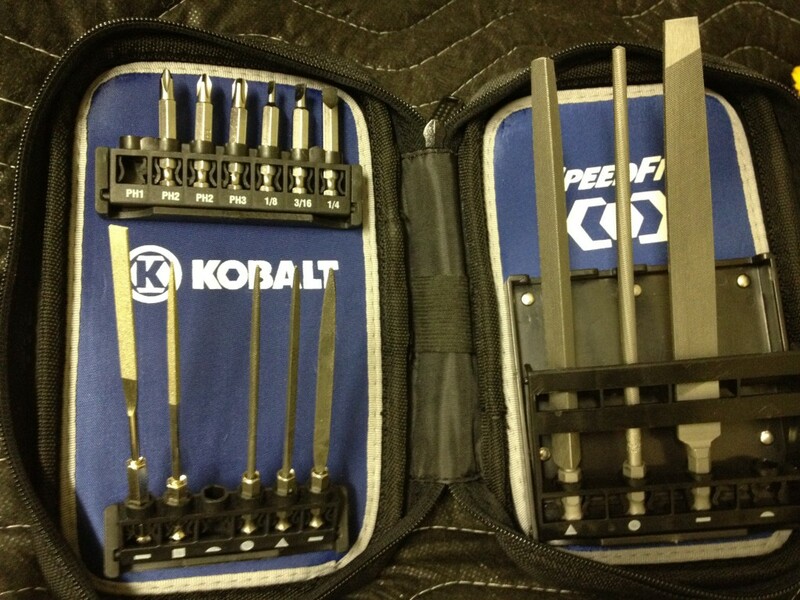 I decided to get a decent file kit. One of the files was curved on one side and flat on the other and worked really well to remove the metal burrs. This file kit had a good mix of sizes and a handle.. about $26. 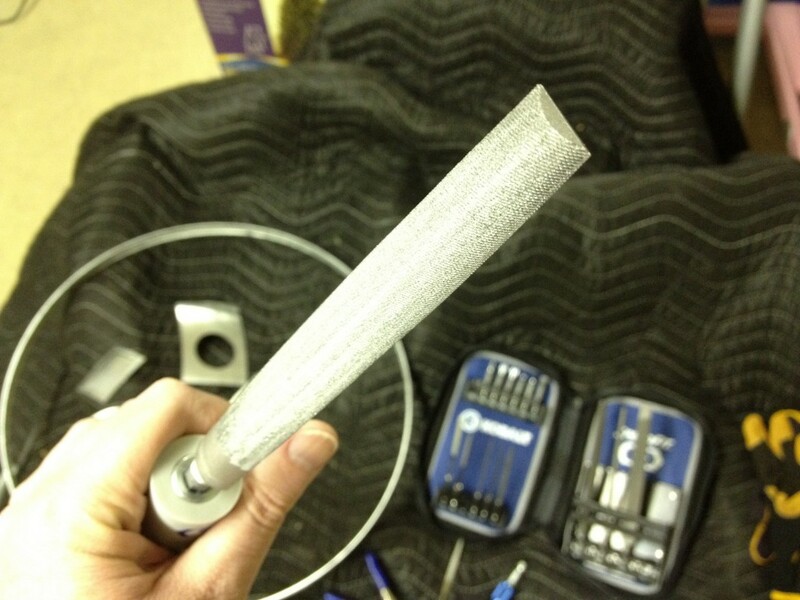 This is the file I used the most to remove all the metal burrs left behind from the laser cut. The above file was perfect for working in the curved panels. Next I’ll need to go over all the cuts with a finer grit sand paper. I have some 200 emery cloth that I’m going to try. I don’t want to mess up the spin lines if possible. 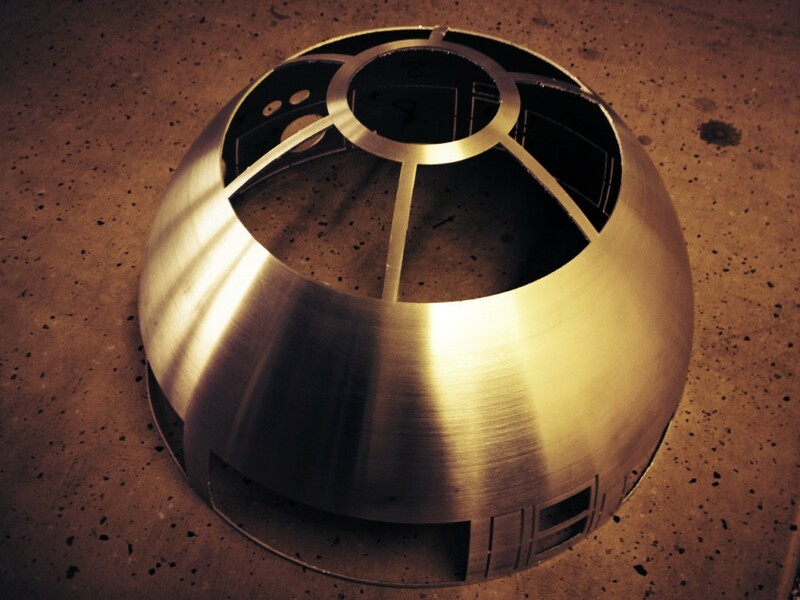 The outer dome should find a perfect fit on the inner dome so that it can be bonded (glued) together. But you can see here that there is a gap. Perhaps the outer dome needs to be forced down, but I’m not sure yet. 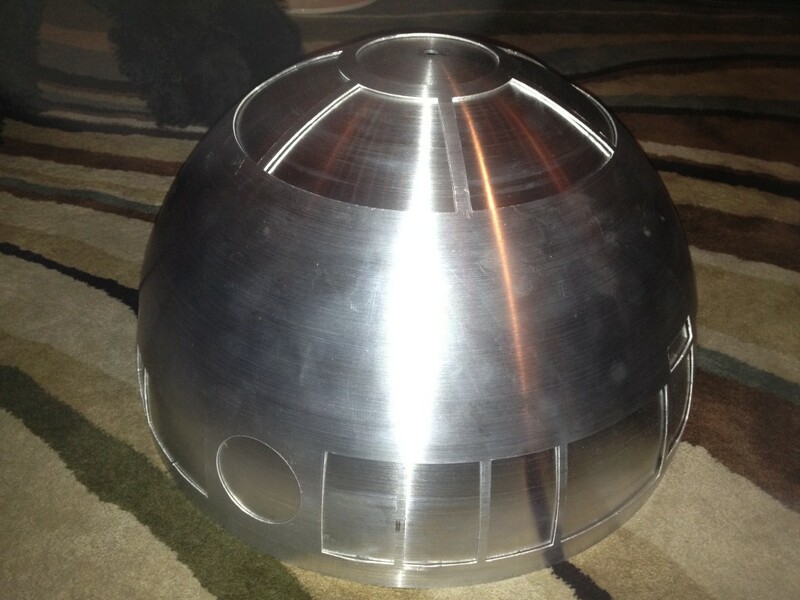 Perhaps when the inner dome panels are cut out it will fit together better. The outer dome fit on the inner dome leaves a small gap that will need to be tightened up. 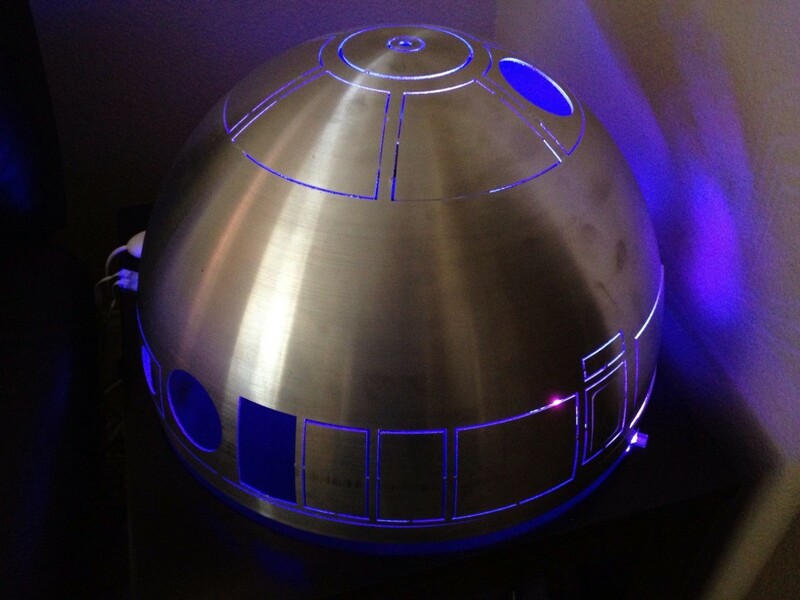 I also suspect it could be because the laser cutting wasn’t completely centered on the dome spin. This picture below shows the top panel from the dome. The hole was the center (circumcenter?) of the spin. This hole is off center from the cut around it, signifying that the laser cutting wasn’t perfectly centered around this. Meaning that the curvature of the dome wouldn’t be perfectly symmetrical, but rather is offset slightly. My guess is that all the domes are like this to some degree. It’s probably impossible to get it perfectly centered. And I doubt it would be noticed in the finished product. Still I wonder if this would make the domes not fit perfectly together. 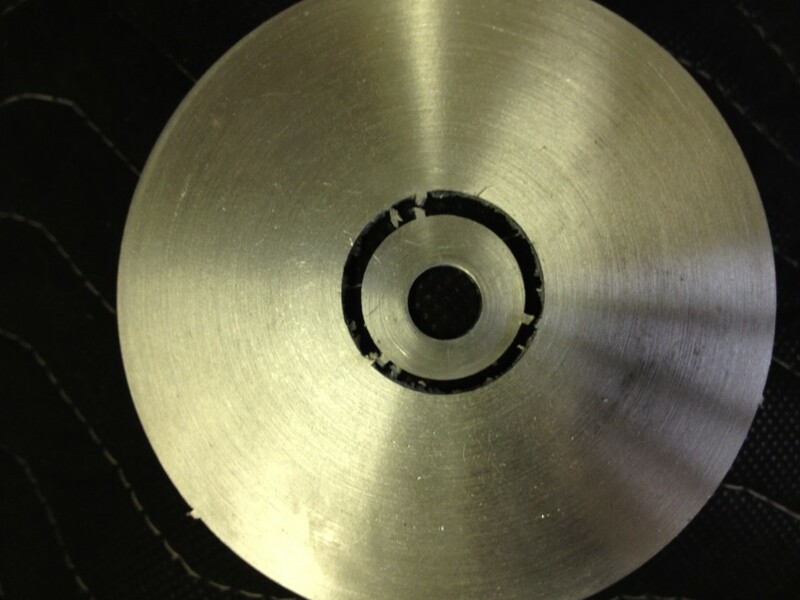 The center ring shows that the laser cutting was slightly off center from the dome spin. Finally.. while waiting for the next stage of work, I have the inner dome resting on the outer one. 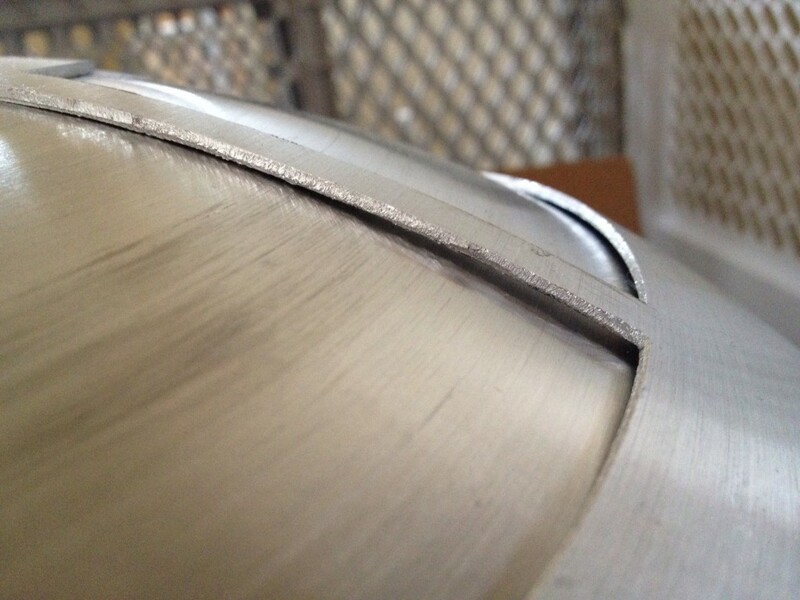 The safest place for the now cut outer dome to sit is resting on the solid inner dome. After finding the best fit, mark the holes on the inner dome and then mark the holes that need to be cut on the inner dome. Overcome my fear and cut the inner dome where needed. And don’t mess that part up (or cut myself in the process). This will be a big one. File/sand the holes where some other part need to fit in.. like the HP’s or the Logic Surrounds. Still need to buy a rockler bearing and an aluminum Radar Eye. Assemble the electronics for the dome lighting kit. 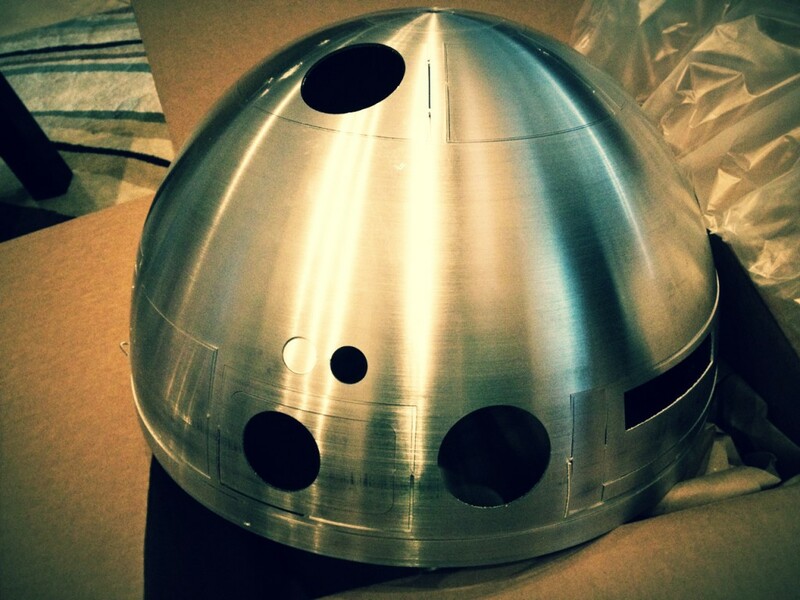 I have one of the styrene domes, which are laser cut the same way, and In fact made on molds cast from the aluminum dome. I found that I had to sand the inner dome a lot before the gap was gone and I got a good fit. This is just the normal process. Don’t be afraid to give the inner dome a good sanding. Thanks. At this point I’m waiting until I get my hinges before going too deep, but if I get time I’m going to keep cleaning up the panel pieces. Just wanted to say I really like your blog. Just starting work on my dome and this helped a lot.